Big Narstie has joined forces with Nightcrawlers x John Reid to update their ‘90s club hit ‘Push The Feeling’ for 2018. The idea to bring back the track first started when Nightcrawlers X John Reid performed live on DJ Target’s BBC 1Xtra Takeover show, and a whole new generation suddenly got switched onto possibly one of the biggest dance records of the past two decades. Updated and produced by UK Garage artist Mike Delinquent, he brought Big Narstie on board to bring the original bang up to date with a full set of new lyrics. ‘Push The Feeling feat. 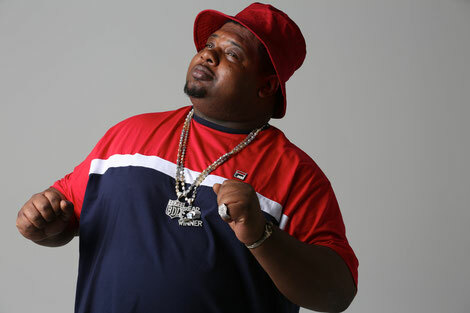 Big Narstie’ has already had heavy plays from Kiss Fresh (where it’s playlisted), Capital Xtra, and BBC 1Xtra and DJ Target premiered the single on Radio 1, where it’s picked up five spins to date. Narstie performed it live on Alan Carr’s New Year Specstacular 2017 on Channel 4, alongside TV appearances including the BBC’s This Week, The Big Fat Quiz Of The Year, and Good Morning Britain. Included in Spotify’s New Music Friday UK upon release the track is up to 320k total Spotify streams, and additions to Massive Dance Hits, All Night Dance Party, You Can Do It, Ministry of Sound, Dance Nation, NYE, Running Workout Goals, House Party Mix, Weekend Warmup, Ministry of Sound, Dance All Night, Remixes 2017/2018, and the UK Viral 50. Big Narstie’s collaboration with Craig David ‘When The Bassline Drops’, went Gold; receiving over 10 million streams as well as a national TV appearance on the Jonathan Ross show. Narstie’s array of creative outlets include the Base Society Mixtape, and further collaborations with Robbie Williams, Ed Sheeran, Section Boyz, and more. He’s appeared on Channel 4 to discuss the lack of diversity at the Brit Awards, alongside debates at Oxford University. He starred in the six times nominated British Film Awards’ movie Rise of the Footsoldier II. His awards include GRM Daily’s Rated Awards’ Personality Of The Year 2015, Noisey Man of the Year 2013 and received a MOBO nomination in 2014. He’s also a festival pro, performing at Wireless Pepsi Max Stage, NASS, Lovebox, Ibiza Rocks, Truck Festival, Brownstock, Eski Dance and many more. His work with VR company, CEEK, saw him become the first British musician to enter the world of virtual reality, alongside artists such as U2, MegaDeth, Katy Perry, and Ludacris (https://ceek.com). John Reid’s roots began in soul music, and he started refining his craft as a songwriter as the front man of the Nightcrawlers, with tours, festival shows, and TV performances across the world following the No.1 success of ‘Push The Feeling On’. As a songwriter he continues to travel the world working with top recording artists, songwriters and record producers. He’s won an Ivor Novello Award and multiple BMI Awards, writing hit after hit for the likes of Kelly Clarkson, Il Divo, Westlife, Tina Turner, Rod Stewart, Leona Lewis, Lawson, Andrea Bocelli and Keith Urban. John wrote the US No.1 hit ‘Only You Can Love Me This Way’ for Keith Urban that gained him the BMI Award for Song Of The Year. John's solo project, the Nightcrawlers Soul Sessions, began with an EP release this month. The track is out 16 March on Relentless.